Trypsin-like serine proteases are involved in a large number of processes including digestive degradation, regulation of developmental processes, yolk degradation and yolk degradome activation. Trypsin like peptidases considered to be involved in digestion have been characterized in Lepeophtheirus salmonis. During these studies a trypsin-like peptidase which differed in a number of traits were identified. An intronless trypsin-like serine peptidase (LsTryp10) from L., salmonis was identified and characterized. LsTryp10 mRNA is evenly distributed in the ovaries and oocytes, but is located along the ova periphery. LsTryp10 protein is deposited in the oocytes and all embryonic cells. LsTryp10 mRNA translation and concurrent degradation after fertilization was found in the embryos demonstrating that LsTryp10 protein is produced both by the embryo and maternally. The results furthermore indicate that LsTryp10 protein of maternal origin has a distribution pattern different to that of embryonic origin. Based on present data and previous studies of peptidases in oocytes and embryos, we hypothesize that maternally deposited LsTryp10 protein is involved in regulation of the yolk degradome. The function of LsTryp10 produced by the embryonic cells remains unknown. To our knowledge a similar expression pattern has not previously been reported for any protease. Trypsin-like serine peptidases of the S1A subfamily (hereafter referred to as S1A peptidases) are found in all metazoan groups and are involved in a variety of biological processes [1, 2]. They are synthesized as inactive zymogens which are activated by proteolytic cleavage at a defined site N-terminal to the proteolytic domain. They may consist of the proteolytic domain only (referred to as single domain peptidases) or may contain one or more additional domains, generally N-terminal to the proteolytic domain (referred to as multi domain peptidases). S1A peptidases are generally extracellular peptidases although some have intracellular functions [2, 3]. S1A peptidases involved in digestion commonly consist of a proteolytic domain only, but single domain S1A peptidases may exhibit strict specificity and serve regulatory roles [4–6]. However, regulatory S1A peptidases generally include one or more additional domains [2, 5, 7]. Trypsins are S1A peptidases with a specific architecture that cleave substrates after Arg and Lys . They are common digestive enzymes in metazoans and their zymogens are activated by trypsins or enteropeptidases . Once activated, the digestive trypsins contribute to the proteolysis of ingested proteins and also activate other digestive zymogens such as chymotrypsinogens and proelastases . S1A peptidases also play important roles during fertilization and early development; at fertilization S1A peptidases are necessary to prevent polyspermy by catalyzing formation of a fertilization envelope [8, 9] and in the early embryo, S1A peptidases participate in developmental control [10, 11] and cell migration [12, 13]. Egg yolk degradation has been reported to be catalyzed both by aspartic and cysteine cathepsins and serine peptidases, including S1A peptidases [14–20]. S1A peptidases involved in egg yolk degradationare suggested mainly to serve in degradome activation [14, 17, 21], but it should be noted that the main mechanism controlling activation of yolk degrading proteases appears to be decreasing yolk granule pH [14, 15, 22]. Proteins needed before the midblastula transition are supplied maternally or encoded by maternal mRNA. S1A peptidases exerting their role in the embryos prior to the midblastula transition appear to be transcribed and translated either maternally  or by germ line cells other than the oocyte . Proteases involved in, or putatively involved in, yolk degradation generally appear to be translated before fertilization [24–26] although embryonic transcription and translation of a vitellogenin degrading S1A peptidase has been reported in Bombyx mori . However, the exact spatiotemporal patterns of transcription and translation are unknown for many peptidases active during early development. Maternal transcripts have been reported to comprise transcripts from more than 50% of the protein encoding genes in an organism [27, 28]. However, detailed studies of maternally encoded S1A peptidases have not been reported previously. Salmon lice (L. salmonis) are obligate ectoparasites on salmonid fishes and a major pest in salmon aquaculture. Adult female salmon lice are fertilized by males that deposit spematophores at the genital segment . At regular temperature dependent intervals (approximately 10 days at 10°C (personal observations)) they produce a pair of eggstrings (containing ≤ 1500 eggs) that are fertilized when they are extruded . During characterization of trypsins and trypsin-like peptidases in L. salmonis [30–33] we identified an intronless single domain trypsin that was transcribed by adult female L. salmonis (LsTryp10, accession# EF490878). In the present study LsTryp10 is characterized and functional implications are discussed. EST sequencing led to identification of a 1052 b.p. transcript encoding a serine proteinase named LsTryp10. The transcript consist of a 810 b.p. ORF, a 37 b.p. 5' untranslated region (UTR) and a 205 b.p. 3' UTR. Alignment of genomic and corresponding cDNA sequences revealed that LsTryp10 is devoid of introns. The protein was predicted to be secreted from the cell using the analytical strategy recommended by Emanuelsson et al. . The encoded 270 amino acid (a.a.) protein with a predicted weight of 30 kDa consist of a putative 17 a.a. signal peptide, a 10 a.a. activation peptide and a 243 a.a. proteolytic domain. The proteolytic domain in the predicted protein includes the catalytic triad His57, Asp102 and Ser195 in a sequence context typical for proteinases of the S1A subfamily in addition to residues characteristic for S1A peptidases with trypsin specificity, including Tyr172, Asp189, Gln192, Gly216 and Gly226 (chymotrypsinogen numbering ). The encoded trypsinogen appear to contain the 3 cysteine bridges conserved in S1A peptidases  and an additional cysteine bridge between Cys106 and Cys129. However, LsTryp10 do not contain the disulphide bridge (Cys59 to Cys104) conserved in previously described single domain trypsins from L. salmonis . The overall identity to previously published trypsins from L. salmonis [30, 31, 37] was ≤ 33%. The phylogenetic analysis shows that vertebrate, crustacean and insect trypsins reside on separate well-supported branches (Fig. 1). Furthermore the vertebrate acrosins, found in sperm cells, form a distinct group within a well-supported monophyletic clade that includes Cortex Granule Serine Protease 1 (CGSP1) found in sea urchin eggs. Most of the internal nodes in the phylogenetic tree were not supported (Fig. 1) due to the high frequencies of highly conserved and highly divergent residues resulting in relatively low prevalence of informative semi-conserved residues. 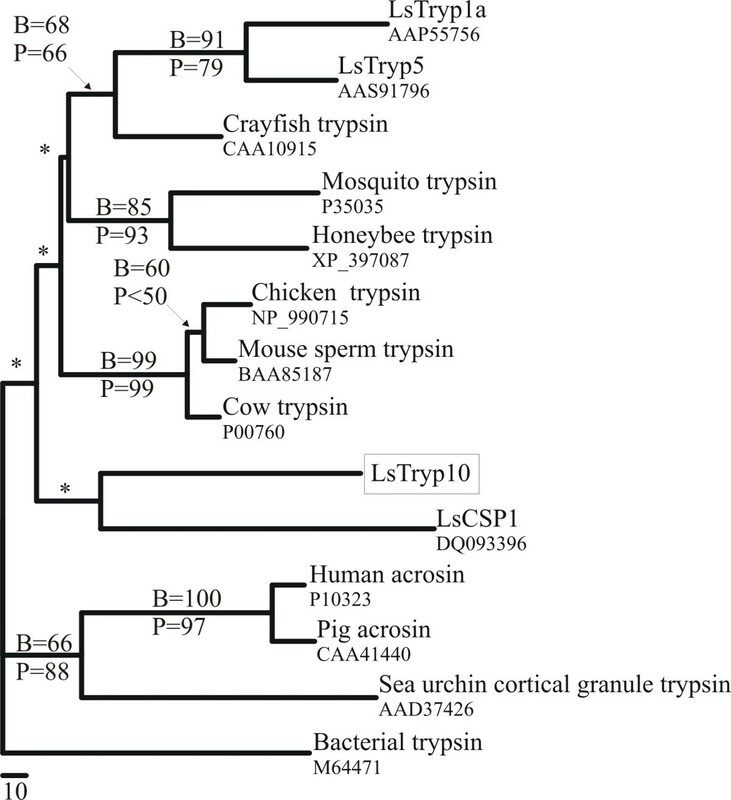 LsTryp10 does not appear to be closer related to previously characterized L. salmonis single domain trypsins  than to any of the other supported trypsin branches. It should be noted that although LsTryp10 resides on the same branch as the clip domain containing serine peptidase LsCSP1  this position is not supported (Fig. 1). Maximum likelihood tree. The tree was generated by the Proml module in the Phylip package. Phylogenetic analysis of selected S1A peptidases. Support was calculated by bootstrapping (B) and quartet puzzling (P). Unsupported branches are indicated by *. Bacterial trypsin was used as outgroup. Accession numbers are indicated in the tree. A single transcript of approximately 1200 b.p. was identified in the northern hybridization analysis (Fig. 2). This corresponds well with the 1073 b.p. cDNA sequence. In northern blot analyses LsTryp10 mRNA was undetectable in adult males but present in mature females and unfertilized eggstrings (Fig. 2). This pattern was confirmed by Q-PCR analyses where LsTryp10 mRNA was present at background levels in preadult stages and adult males, but was significantly upregulated in adult females (Fig. 3). Microarray analysis have furthermore shown that LsTryp10 transcript abundance increase during development after the last molt in females (Contig 328 in Eichner et al. ). Northern blot analysis of LsTryp10 and eEF1α. 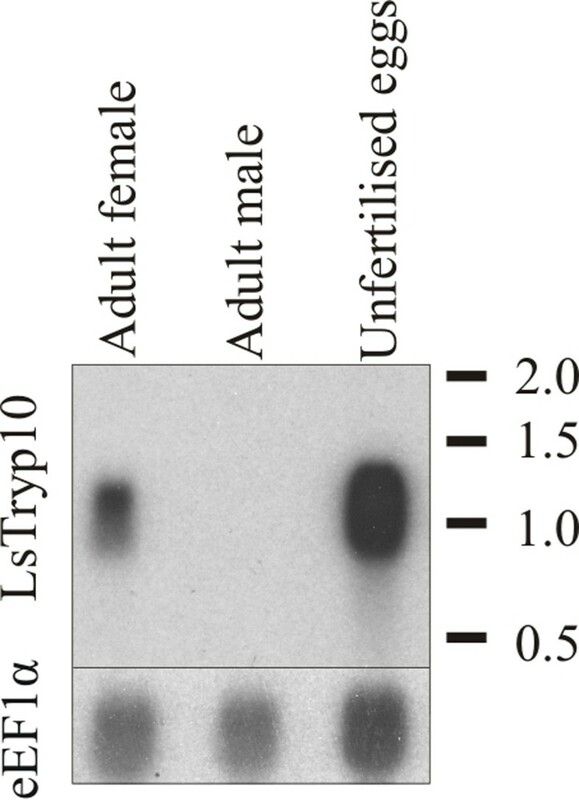 Northern blot analysis showing the size of LsTryp10 and relative LsTryp10 and eEF1α transcript levels in adult females, males and unfertilized eggs. Loaded total RNA was approximately 4.5 μg RNA pr. well. Exposure times for LsTryp10 and eEF1α are dissimilar. LsTryp10 transcript levels. 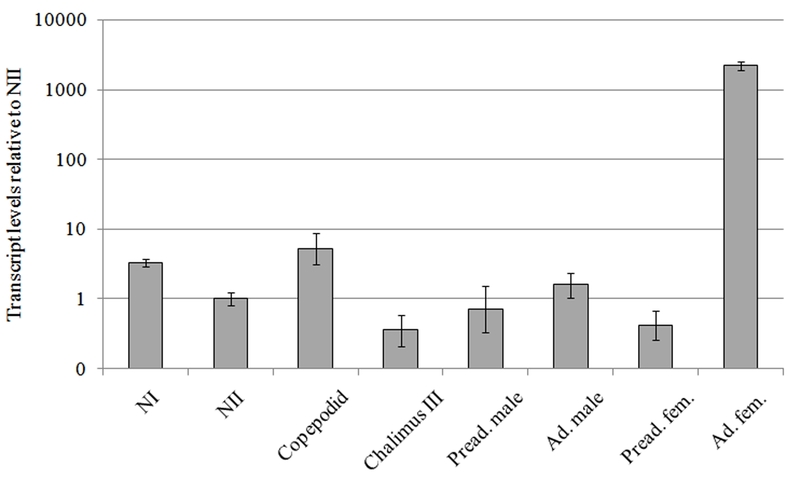 LsTryp10 transcript levels at different developmental stages quantified relative to the level found in the nauplius II (NII) stage. Error bars show 95% c.i. calculated from the ΔΔCT values from each dilution. The error bars for NII show the 95% c.i. calculated from the ΔCT values. Note the logarithmic vertical axis. In situ hybridization showed that LsTryp10 mRNA was present in the ovary and in the oocytes throughout the oviduct (Fig. 4F–J). LsTryp10 mRNA is homogenously dispersed in the oocytes localized in the anterior part of the oviducts in cephalothorax. Upon entry into the genital segment the oocytes expand substantially in size, apparently due to incorporation of granules and lipids, and LsTryp10 mRNA becomes localized to the periphery of the ova (Fig. 4F). LsTryp10 mRNA localization and histology. A. Adult female L. salmonis with eggstrings, broken white line indicates location of section shown in B. e: eggstrings. B. Section of adult female L. salmonis. ov: ovary; ovd: oviduct. C. Immature oocytes (o) in the oviduct. D. Transition from immature oocytes in the oviduct (C) to mature oocytes in the genital segment (E). E. Mature oocytes (mo) in the genital segment after being filled with droplets and granules. Note that the chromosomes appear to be in the pachytene or diplotene stage both in the immature and mature oocytes (arrows in C and E). ISH using antisense (F, H, J) and sense (G, I, K) RNA probes show that LsTryp10 mRNA is present in the ovary (ov), in immature oocytes (io) in the oviduct (ovd) as well as in mature oocytes in the unfertilized eggstring (ufe). In the mature oocytes LsTryp10 mRNA is localized along the oocyte periphery (arrowheads in F, corresponding locations in negative control (G) also marked with arrowheads). Bar = 1 cm in A, 100 μm in C-K.
LsTryp10 protein was found in embryos and unfertilized mature eggs. In the unfertilized oocytes inside the genital segment LsTryp10 was distributed along the oocyte periphery and in patches associated with yolk granules (Fig. 5A). After fertilization, LsTryp10 was also shown to be present throughout the embryonic cells and in patches associated with yolk granules (Fig. 5C, D). Negative controls were performed without primary antibodies and confirmed specific staining. Relative quantification showed that the LsTryp10 protein level in the fertilized eggs increased between 1 hour and 48 hours after fertilization and then remained stable, whereas the encoding LsTryp10 mRNA level decreased steadily from 1 to 192 hours after fertilization (Fig. 6). 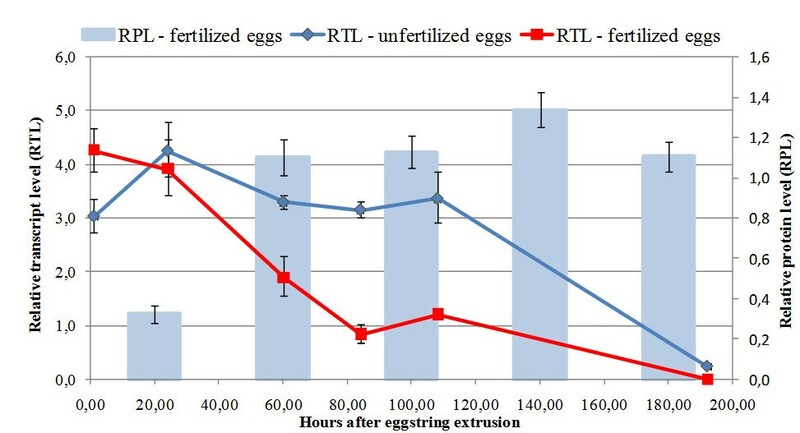 In contrast the LsTryp10 mRNA level in unfertilized eggs appeared relatively stable between 1 and 108 hours after extrusion and then decreased to a level comparable to that found in fertilized eggs 192 hours after fertilization (Fig. 6). The yolk compartment was shown to be acidic at day 5 after fertilization by exposing embryos to LysoTracker, whereas no indications of acidic compartments were identified elsewhere in the embryo (results not shown). Immunolocalization of LsTryp10. A and C: Confocal section showing the peripheral and yolk associated (green arrows) localization of LsTryp10 (red) in unfertilized oocytes within adult females (A) and in fertilized eggs 30 minutes after fertilization (C). B: Fertilized eggstrings 8 days after fertilization. D: Left side: Boiled embryo 5 days after eggstring fertilization. Note the localization of the yolk compartment (granular content). 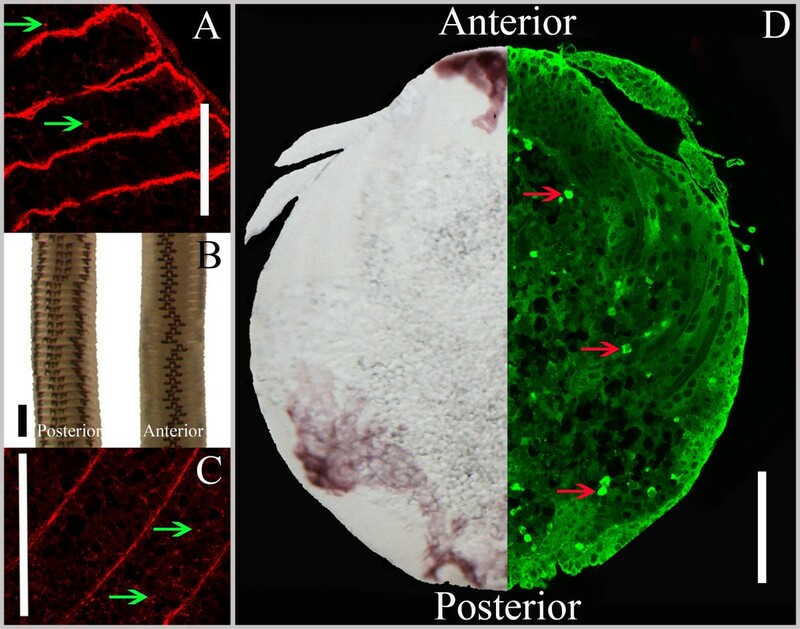 Right side: Confocal section showing localization of LsTryp10 (green) in the embryonic tissue and associated with yolk granules (red arrows). Bars indicate 225 μm in B and 100 μm in A, C and D.
Relative protein and mRNA levels in developing embryos. Relative LsTryp10 encoding transcript levels in unfertilized and developing fertilized eggs (RTL – see text for details) determined by Q-PCR. The connective lines are added for clarity and do not necessarily reflect transcript level progression. The relative LsTryp10 protein levels (RPL) in developing fertilized eggs determined by ELISA studies are also shown. Error bars indicate 95% c.i. The results show that LsTryp10 encodes a peptidase that includes the catalytic triad residues (His, Asp and Ser) in a context typical for serine peptidases of the S1A clan in addition to the specificity determinants for trypsin . Transcript length and presence was confirmed by northern blot analysis (Fig. 2). Interestingly, LsTryp10 is devoid of introns, which is a feature also reported for functional digestive trypsins in Anopheles gambiae . The phylogenetic analysis do not indicate a reliable phylogenetic position for LsTryp10, which appears no closer related to other single domain trypsins from L. salmonis [30, 31, 33, 37] than to bacterial trypsin or the clip domain containing LsCSP1 . CGSP1, which is thought to activate the fertilization envelope and prevent polyspermy in sea urchins , appears to be closer related to acrosins than to the other serine peptidases included in the analysis. Since this may give the impression that S1A peptidases related to fertilization form a monophyletic assemblage it should be noted that mouse TESP4 which is suggested to have a fertilization related function , resides on a well supported branch with pancreatic trypsin from cow and chicken (Fig. 1). Background LsTryp10 transcription is detected in all investigated L. salmonis stages except adult females where it is upregulated more than 2000-fold relative to the level in nauplius II larvae (Fig. 3). In situ hybridization results show that LsTryp10 mRNA is transcribed in the ovary. LsTryp10 transcripts are evenly distributed in the immature oocytes in the anterior oviduct in cephalothorax (Fig. 4H, J), but are located along the periphery of the ova in the genital segment (Fig. 4F). The change in distribution of LsTryp10 mRNA indicates that the transcripts are actively localized in the egg, as are the transcription factor bicoid mRNA in Drosophila melanogaster and the transforming growth factor Vg1 mRNA in Xenopus laevis [41, 42]. The 3' UTR in LsTryp10 mRNA is substantially longer (205 b.p.) than the 3'-UTRs (44–104 b.p.) in previously characterized L. salmonis S1A peptidases [30, 31, 33, 37]. Considering that localization of many transcripts, including bicoid mRNA and Vg1 mRNA, depends on elements in their 3' UTRs [41–45] the relatively long LsTryp10 mRNA 3' UTR may contain elements involved in control of mRNA localization and translation. The distribution of LsTryp10 mRNA suggests that it is a maternal transcript. This notion appears to be supported by the simultaneous LsTryp10 mRNA translation and degradation after fertilization (Fig. 6). However, immunohistochemical studies demonstrate this perception to be incorrect as LsTryp10 protein is found in oocytes inside the female's genital segment as well as in most embryonic cells (Fig. 5). The question then arises: Is the embryonic LsTryp10 protein encoded by maternal mRNA? 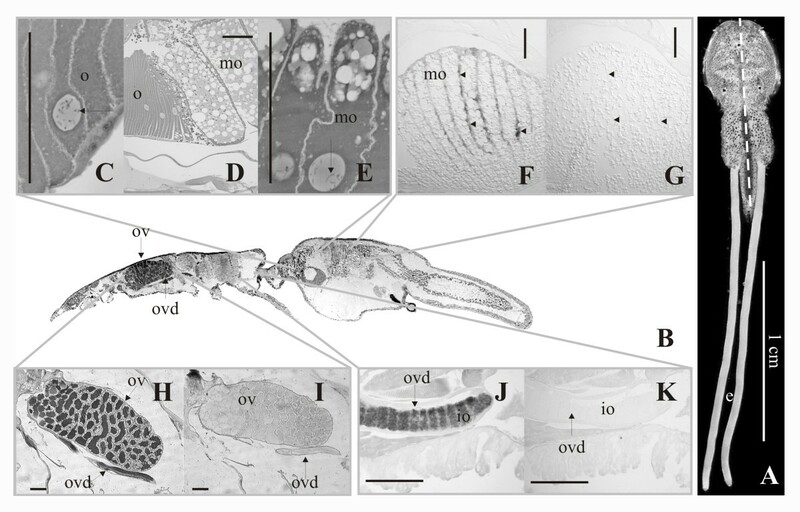 The first cleavage in order Siphonostomatoida (which includes L. salmonis) is holoblastic but strongly unequal with the smaller cell giving rise to the embryonic cells and the larger cell containing most of the yolk [46–48]. A similar development in L. salmonis must be expected which implies that only a small fraction of the deposited maternal mRNA is present in the embryonic cells. The stable level of LsTryp10 mRNA in developing eggs (Fig. 6) may thus be the product of a simultaneous degradation of maternal LsTryp10 mRNA in the large yolk containing cell and zygotic transcription of LsTryp10 mRNA in the developing embryonic cells [47–49]. The very low expected levels of maternal LsTryp10 encoding transcripts inside the embryonic cells thus strongly indicates that LsTryp10 protein translated after fertilization is encoded by zygotically transcribed LsTryp10 mRNA. It is plausible that the maternal and zygotic LsTryp10 mRNAs are encoded by paralog genes. In conclusion, LsTryp10 is a trypsin which is both deposited in the oocytes and translated after fertilization. Maternally deposited and embryonic LsTryp10 seems to be translated from different pools of mRNA; one maternally transcribed and one transcribed after fertilization. The deposited LsTryp10 is likely to be involved in egg yolk degradation whereas embryonic LsTryp10 appears to serve a different purpose, e.g. cell matrix modification. LsTryp10 is the first arthropod peptidase reported to be both maternally deposited and translated in developing embryos. An intronless trypsin-like serine peptidase, LsTryp10, was characterized in L. salmonis. LsTryp10 mRNA was significantly upregulated in adult females relative to all other investigated stages. LsTryp10 mRNA was found in the ovaries, oviducts, ova and developing embryos. The encoded protein was found in ova as well as in developing embryos where it was also shown to be translated. Considering the pattern of the first cell divisions in L. salmonis, the present results indicate that LsTryp10 proteins in the embryos stem from two distinct lines of synthesis. First maternally transcribed and translated LsTryp10 protein is deposited in the oocytes and second embryonically transcribed LsTryp10 mRNA is translated in all embryonic cells. The maternally produced LsTryp10 protein is likely to be involved in yolk degradation or yolk degradation control, whereas the function of embryonically produced LsTryp10 protein is unknown. L. salmonis were cultured on Atlantic salmon (Salmo salar (Linnaeus)) as described previously . L. salmonis for quantitative real-time PCR (Q-PCR) analysis were sampled as nauplius I larvae (n≈10000), nauplius II larvae (n≈10000), infectious copepodids (n≈5000), chalimus III (n = 35), preadult I&II males mixed (n = 10), preadult I females (n = 10), adult males (n = 16) and adult females (n = 10). L. salmonis for Q-PCR and cDNA sequencing were stored in RNA later (Ambion, Huntingdon, UK), for 24 hours at 4°C and then at minus 20°C. Adult females used for isolation of genomic DNA were stored in 70% ethanol. Eggstrings for transcript quantification were sampled from fertilized females and unfertilized females. These were obtained by incubating preadult II females on salmon (not previously infected) with and without adult L. salmonis males. The copulative statuses for the groups were confirmed by visual examination for spermatophores. The eggstrings were sampled at 1 hour (± 30 minutes), 24 hours (± 4 hours), 60 and 108 hours (both ± 8 hours) after fertilization and stored at -80°C. Eggstrings for protein analysis were sampled after 1 hour (± 30 minutes) and 48, 72, and 96 hours (all ± 8 hours). Expressed Sequence Tags (ESTs) from L. salmonis were obtained as described previously  and are described in Eichner et al. . The trypsin encoding EST clone with the longest insert was selected and completely sequenced on both strands using primer walking. Additional 5' sequence was obtained as described previously . Based on the obtained cDNA sequences, primer pairs for genomic PCRs were constructed and the resulting PCR products were cloned and more than 30 clones were completely sequenced on both strands using primer walking. Additional genomic sequence was obtained using the GenomeWalker kit in accordance with the manufacturers instructions (Clonetech, Mountain view, California, USA). Total RNA was purified from unfertilized eggstrings, an adult male and an adult female L. salmonis using TRIZOL® following the manufacturers recommendations (Life Technologies, Gaithersburg, Maryland, USA). Northern blotting was performed using approximately 4.5 μg RNA per well and sequence specific [32P] labeled DNA probes against the LsTryp10 ORF and the homogeneously transcribed eEF1α . Membranes were prehybridized 30–60 min. at 68°C in PerfectHyb solution (Sigma-Aldrich Norway, Oslo, Norway). Denatured probes were added and incubation was continued over night. After washing twice for 10 min. at 68°C in 0.1× SSC/0.1× SDS, signals from the membrane were detected using Kodak BioMax MS X-Ray film (Kodak, Rochester, New York, USA). Sequence handling and editing was done using Vector NTI 9.1.0 (Invitrogen, Carlsbad, California, and USA.) and GeneDoc http://www.psc.edu/biomed/genedoc. For analysis of a plausible protein location the translated LsTryp10 sequence was analyzed by submission to TargetP 1.1 , SignalP 3.0 , TMHMM 2.0 , TMBETA-NET  and big-PI  according to the suggestion by Emanuelsson et al. . Phylogenetic analyses of selected amino acid sequences corresponding to the mature peptidases were performed using the Phylip package  and Tree-Puzzle v. 5.2 . Mutation rate heterogeneities were calculated in Tree-Puzzle using the JTT model and 8 rate heterogeneities. The distribution coefficient α was 0.93. A maximum likelihood tree was generated by Proml in the Phylip package (jumbling 10 times) and support was calculated by bootstrapping (100 replicates in Phylip) and puzzling (10000 times in Tree-Puzzle). The transcript levels during the L. salmonis life cycle and in eggstrings at different ages after fertilization were determined by Q-PCR using ABI 7900 HT (eggs and embryos) and ABI 7700 (adults and larval stages) PCR Systems (Applied Biosystems, Foster City, California, USA) at standard settings. The real-time primers and probe were: Forward primer: TTG CAA GAC CGG AAC AAG AAC. Reverse primer: CAA ATC TGA GTA CAC CCC AAC CT. Probe: 6FAM-CAA CTA CAA GAG GTG TCC CAT CCG GG-TAMRA. The real time assays were performed as previously described  with the modification that additional TurboDNase (Ambion, Huntingdon, UK) treatments were performed on the RNA from nauplius I and II, chalimus III and preadult males and females. The results were analyzed by the ΔCT approach  as described previously . The 95% c.i. values at each developmental stage presented in Fig. 3 were calculated from the average ΔΔCT values for each dilution, except for nauplius II (which was used as calibrator thereby defining the average ΔΔCT values as 0 for this stage). For nauplius II the 95% c.i. shown in Fig. 3 was calculated from the average ΔCT at each dilution. The results were confirmed by analysis using a kinetic approach  as earlier suggested . Where CT mean*dilution is the mean of the CT values of all samples at a given dilution and CT sample*dilution is the mean CT value of the sample parallels at a given dilution. The relative transcript levels (RTL) presented in Fig. 5 are calculated as . The c.i. is calculated from the ΔCT values from the five dilutions. The results were confirmed by analysis using a kinetic approach . The localization of LsTryp10 mRNA in adult female L. salmonis was determined by in situ hybridization as described previously  using a cDNA clone covering 669 base pairs (b.p.) of the open reading frame (ORF) as template for RNA probe synthesis. Hybridizations were performed with antisense probes to show localization of transcripts and with sense probes as negative controls. Labeled probes were visualized using anti-DIG alkaline phosphatase FAB fragment (Roche, Basel, Switzerland) and a chromogen substrate containing Levamisol (Sigma-Aldrich Norway, Oslo, Norway), NTB and BCIP (Roche, Basel, Switzerland). Adult female L. salmonis were fixed in 4% paraformaldehyde in PBS, dehydrated in ethanol (70%, 80%, 90% and 95%) and subsequently embedded in Technovit 7100 following the manufacturers recommendations (Heraeus, Hanau, Germany). Sections (2 μm) were produced using a microtome, stained with metachromatic toluidin and examined using a Leica DMRBE light microscope (Leica Microsystems, Wetzlar, Germany). Where Abscorr*sample is the Abscorr for a protein sample at a given dilution and Abscorr*dilution mean*dilution is the mean Abscorr for all samples at that dilution. The c.i. was calculated from four parallel RPL values for each of the four dilutions. Pilot studies using the above design and the described peptide antiserum as well as five additional peptide antisera at various dilutions were conducted in advance to enable selection of the best serum and appropriate dilutions. Developing embryos from eggstrings 5 days post fertilization were dissected and incubated in 4% paraformaldehyde for 2 hours. Embryos were washed in PBS-AT (PBS, 1% albumin, 0.5% Triton-X) followed by blocking for 2 hours in 3% albumin, PBS, 0.5% Triton-X. The embryos were subsequently incubated with the antiserum used for ELISA (as described above) diluted 1:100 for 20 hours and washed in PBS-AT for 2 hours followed by incubation with Alexa Flour 594 conjugated goat-anti rabbit antibody (Invitrogen, Carlsbad, California, USA.) diluted 1:200 over night. Samples were mounted using ProLong Gold with DAPI (Invitrogen, Carlsbad, California, USA.) Paraffin sections (3 μm) were processed according to standard protocols. Slides were blocked with 3% albumin and incubated for 16 hours with the above mentioned antiserum. Alexa Flour 594 conjugated goat-anti rabbit antibody (Invitrogen, Carlsbad, California, USA.) diluted 1:200 was used as a secondary antibody. Samples were mounted using ProLong Gold(Invitrogen, Carlsbad, California, USA.). Confocal imaging was performed with a Leica TCS SP2 AOBS microscope (Leica Microsystems, Wetzlar, Germany) at the Molecular Imaging Center (FUGE, Norwegian Research Council, University of Bergen). Parallel negative controls were performed without primary antibody. At similar confocal settings no signals were detected from negative controls (except for signal from DAPI where present). Developing embryos were obtained as described in the previous section. The dissected eggs were immediately incubated in filtered sea water with 50 nM LysoTracker (Invitrogen, Carlsbad, California, USA.) for 30 minutes. Embryos were then briefly washed in seawater and visualized as described above. We would like to thank Morten Arnesen, Per Gunnar Espedal, Ingrid Uglenes Fiksdal, Heidi Kongshaug and Dr. Ketil Malde for technical assistance and Dr. Christiane Eichner for fruitful discussions. This work has been financially supported by the Norwegian Research Council. RSM and FN concieved the study, performed the sequence analyses and drafted the manuscript. RSM also performed quantitative real time PCR, in situ hybridization and protein quantification. PF helped coordinate the study and draft the manuscript. SD performed the immunohistochemical studies and helped to draft the manuscript. BOK sequenced cDNA and genomic DNA and helped draft the manuscript. IS helped quantifying protein levels. All authors read and approved the final manuscript.